Red Colored Ethnic Hand-embroidery Hand Sling Bag. Customization entertained. 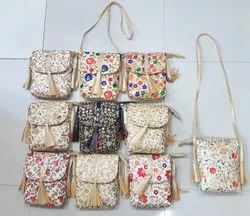 Embroidered Sling bags, Size/Dimension: 10"*9"
Ideal for parties and functions. Traditional embroidered clutches with colorful threads to make them match all your ensembles. Available in multiple designs and colors. Each piece is unique and cannot be replicated.SizeHeight 7.5"Width" 12"
- The Shoulder Strap Ensures Easy Carrying. Desiged As Per Latest Requirement Of End User.